Amma's recipes is one such column on this blog, which is very close to my heart. These are the recipes which my mother perfected over many many years and reflects how awesome a cook she is. It is also fun to just photograph once in a while, without thinking about what and how to make a recipe, worrying whether it would turn out well or not. She Cooks, I Photograph. That is the deal. :-) If you guys have any questions, do drop in a line or comment. My mom will be more than happy to answer all of them. ..and as she was making them, I happily took some step by step pictures to share with you all. 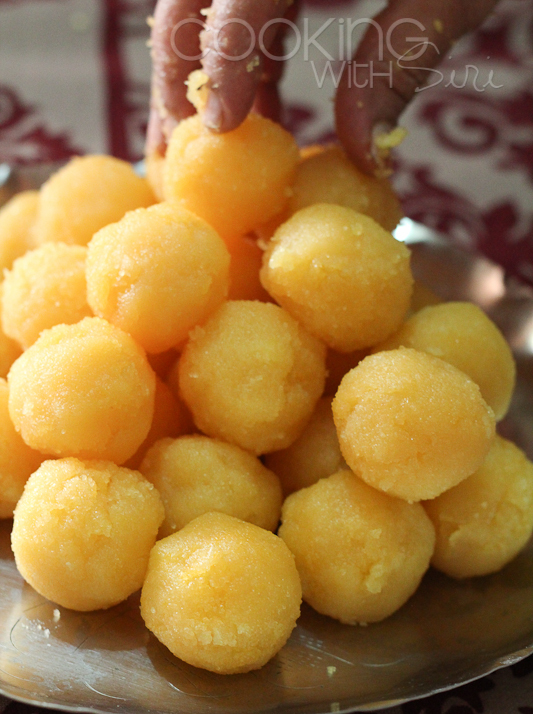 lemon sized Rava Kesari balls - The Stuffing! 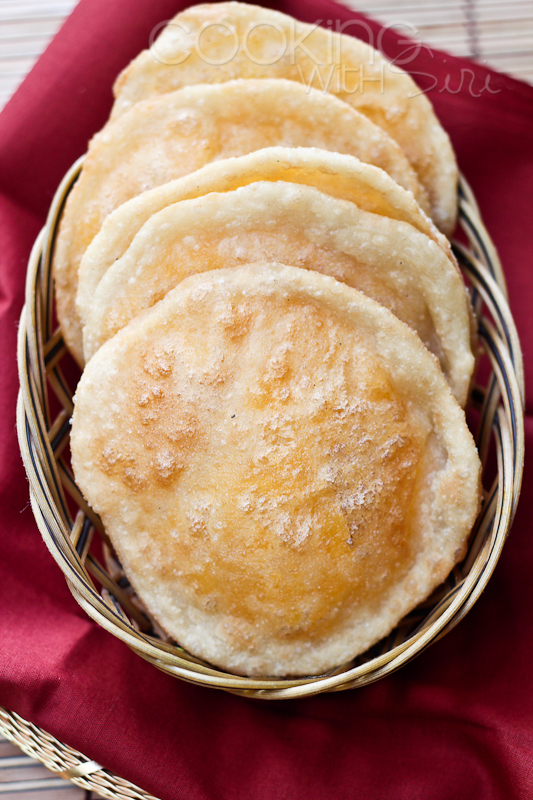 the dough - its consistency must be like a poori dough. Just out of the fryer, draining the excess oil.. 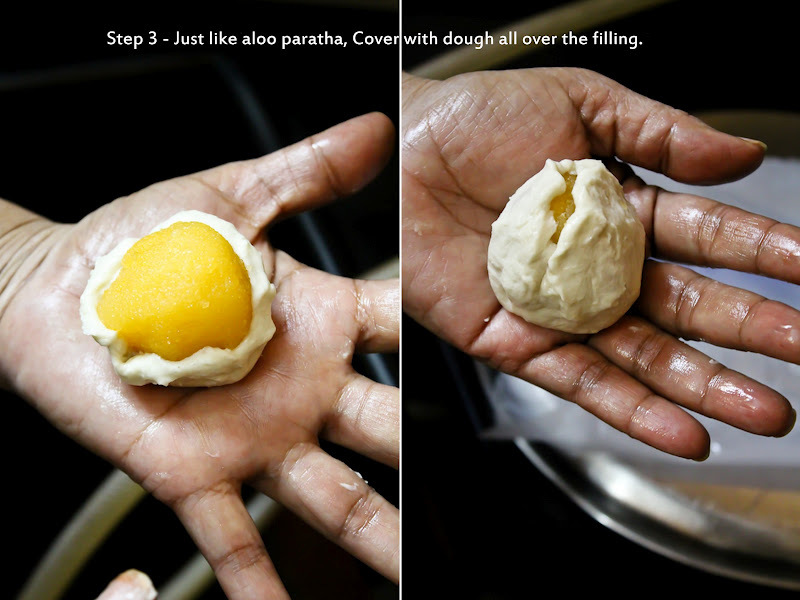 Step 1: Knead maida, rice flour with water into a poori consistency. 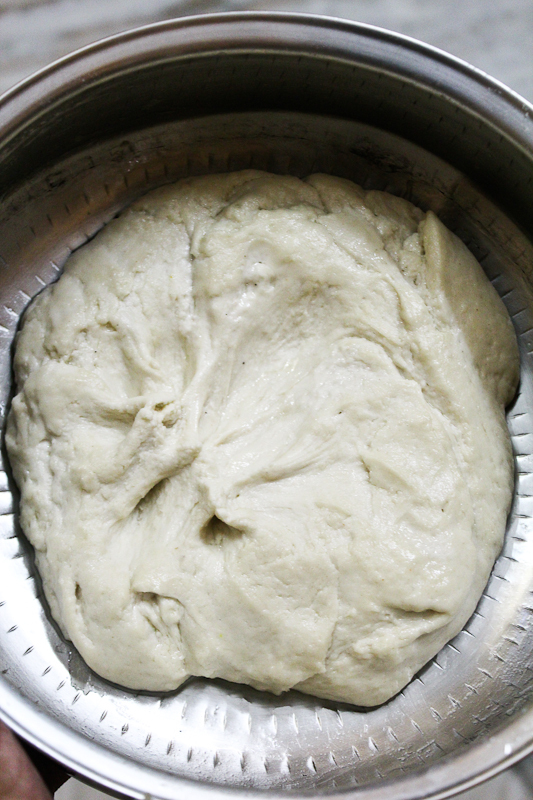 Rub 1/4 cup oil all over the dough. Cover and rest for 2 hours. Step 2: Heat 1/2 tsp of ghee in a small kadai and fry cashews with raisins. Keep aside. Step 3: Heat 3 cups of water in kadai. Add sugar. Stir until it dissolves. Add ghee. Let it come to a rolling boil. Reduce to low-heat and then slowly stir while adding the rava (Make sure there are no lumps). Cook until it is thickened for 5-6 minutes. Just before turning off the heat, add fried cashew with raisins and cardoamom powder. Mix well. It is very important to cool to room temperature as it will be used as a stuffing. Make 10 small lemon sized balls out of it. 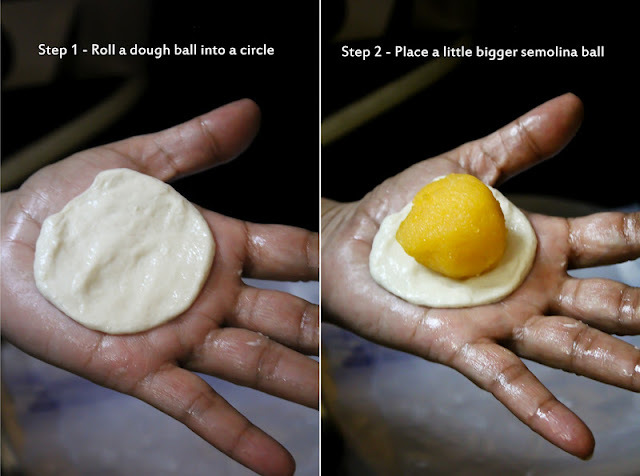 Step 4: Make 10 equal sized balls out of dough. Roll out a small round. Put a kesari ball in the middle. Cover gently with hand. Don't use rolling pin. 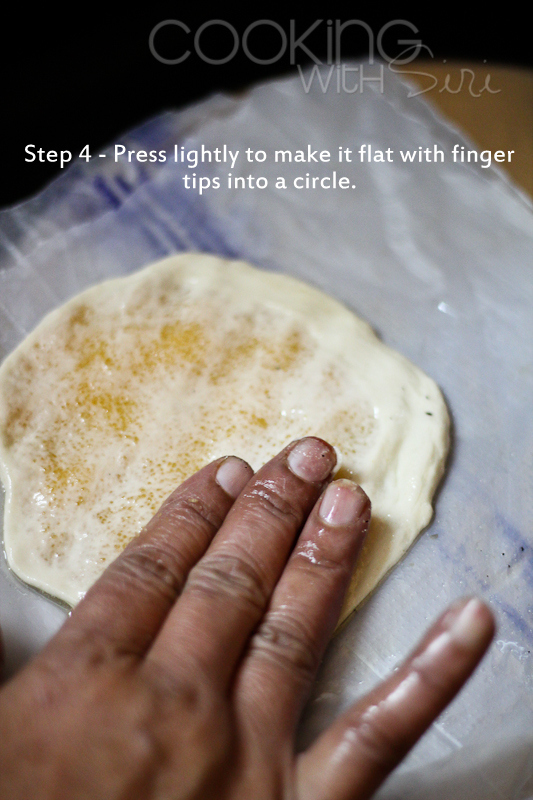 With hand, gently press on each side by placing on a plastic sheet and make into a round. Repeat the same with all of them. Note: Refer to the step-by-step pictures above. Step 5: Heat oil in a kadai. 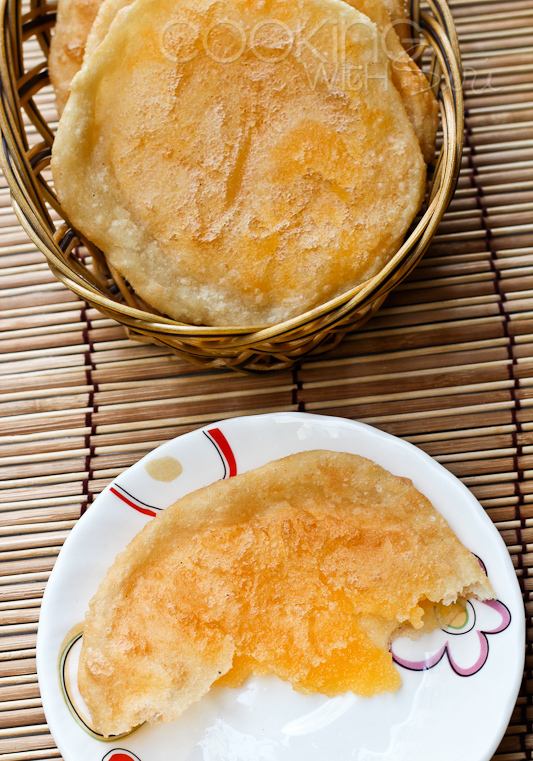 Slide one-stuffed-poori-at-a-time into hot (not smoking) oil. 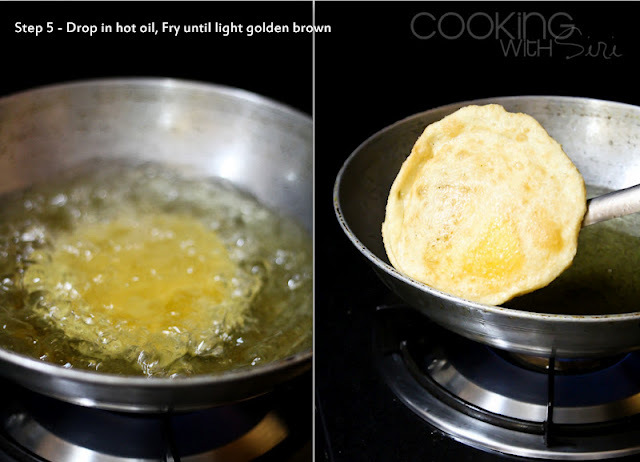 Fry until light golden brown. Drain onto paper towels. These are also made as offering for Vara Lakshmi Vratam which is on July 27th 2012. May be you can woo the Goddess with these goodies this year! I am sure she will be extremely happy, so will be your family & friends! aaaaaaaaaaaaaaaaaa they looks so decadent! i am coming over to amma's place when she makes this next! Wowo this looks super super delicious i love it when you post your amma's recipe here. Thankyou to your amma for all her hard work. Wish i could grab atleast one though. Siri, This is my absolute favorite of all time. Mom makes this the day I land in India everytime without fail. LOVE IT. Yum! I am not too much into traditional sweets like these but my husband is a great fan. Going through all amma recipes. These look great. But I just do not have the patience to make two items - hats off to her. 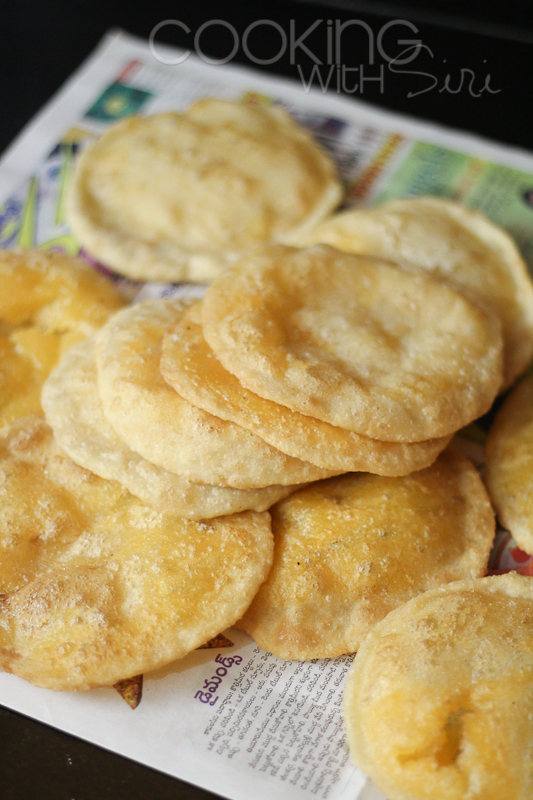 Puri - kesari is a awesome combination.